When I think of comfort foods, rich and unhealthy items like macaroni and cheese or ice cream come to mind. I’m hoping that I’ll eventually be able to train my mind to first turn to something healthy, like this warming and nutritious dal. 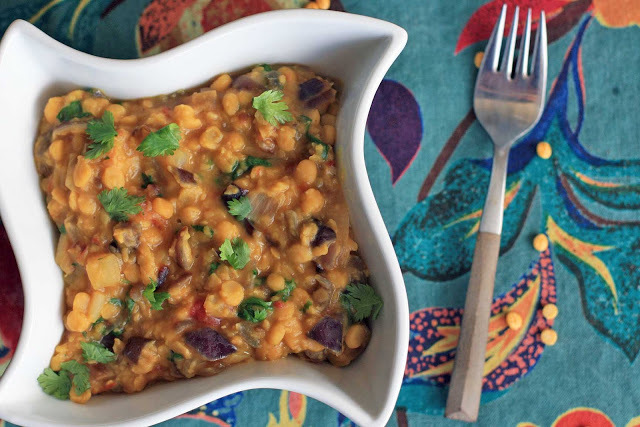 In this Nepali vegetarian dish, yellow split peas and diced tomatoes combine with a spiced onion mixture. The ingredients are pretty simple, but everything combines to create a dish that is anything but boring. So far Nepal has challenged my perception that spices like cinnamon, cloves and cardamom are only for sweet, not savory dishes. 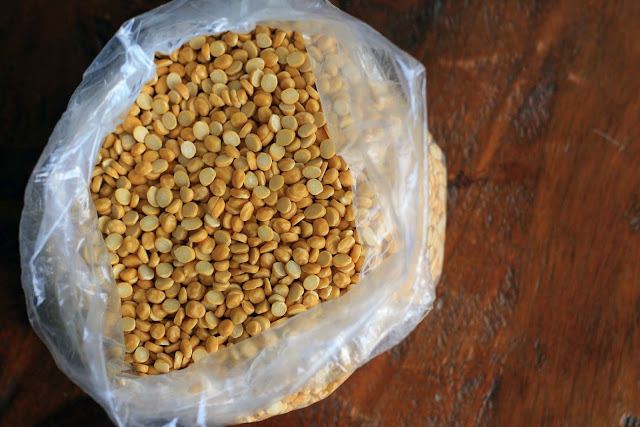 The inclusion of cinnamon and cardamom is really the major difference between this yellow dal and the Indian yellow dal I often make from 5 Spices, 50 Dishes. As long as they’re used somewhat sparingly, these spices add a nice, slightly perfumed aroma and extra depth of flavor to savory dishes. I often eat dal plain, but feel free to serve it over some Basmati rice for a full meal. 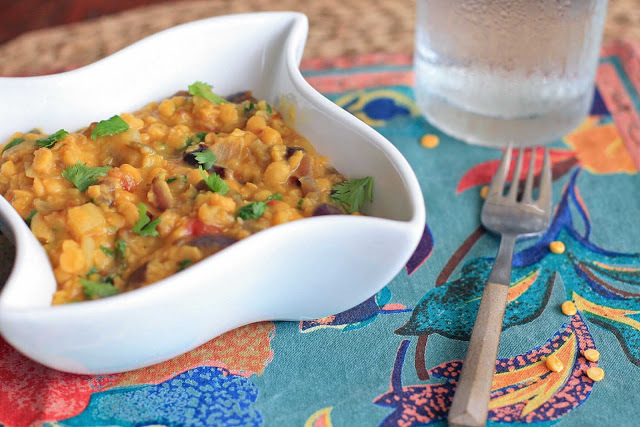 And one final note: dal makes a great weekday meal for company. I often make the split peas the day before. The day of, all that’s left to do is reheat the split peas and then cook up the onion mixture. Easy peasy. Combine the water, split peas, and diced tomatoes in a large saucepan. Cover and simmer over low heat until the split peas have softened. While the split peas are cooking, heat the oil in a large pan over high heat until very hot. Add the cumin and cook, stirring, until very fragrant. 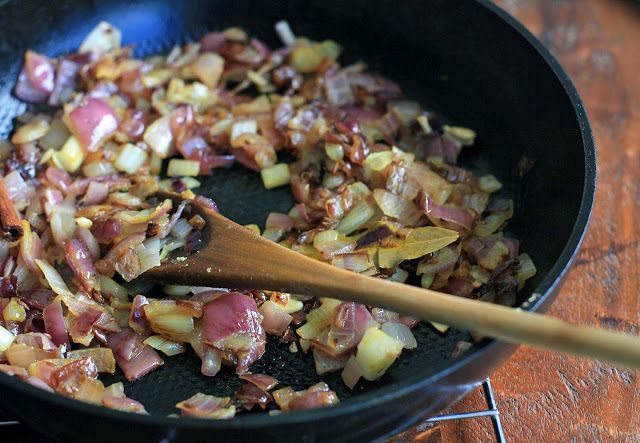 Reduce heat to medium-high and add the onions. Cook, stirring occasionally, until the onion has browned. Add the ginger, garlic, cinnamon, bay leaves, turmeric, and cardamom and stir to mix. Pour into the prepared split peas. Add butter, cilantro and salt and pepper to taste. Let cook over low heat for a couple minutes to allow the flavors to meld.